Alyssabeths Vintage: Creating Christmas Craft Blog Event ! Creating Christmas Craft Blog Event ! Hi everyone, so are you holiday crafting your little hearts out yet? Stuck for ideas or inspirations?? Well... have no fear the crafters are here! 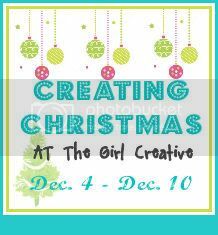 Mark your calenders for the week of December 4 - 10 Alyssabeths will be participating in the Girl Creative's Creating Christmas blog event! I'm so excited, we will have 4 guest crafty bloggers with some wonderful, creative, easy and frugal Christmas Crafts that week and I have a few Dollar Tree crafts up my sleeve for that week! Here's a hint at the wonderful crafts to come! I'm marking my calendar! Can't wait to see your Dollar Tree crafts.